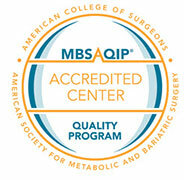 After a rigorous review that examined safety, surgical outcomes, quality of care and overall performance, our Medical Weight Loss and Bariatric Surgery Program has been designated an ACS-MBSA QIP Comprehensive Center With Adolescent Qualifications by the American College of Surgeons, the highest accreditation level available to bariatric surgery facilities. Obesity is a complex, clinical disorder with many contributing causes and factors. The condition is often associated with a wide range of medical problems, including high blood pressure, heart problems, diabetes, sleep apnea, depression, and arthritis. For many patients who are severely overweight, surgical treatment is the only proven method that will help them achieve the long-term weight control required to improve their overall health and enable them to perform normal activities. We believe these procedures provide the best surgical options for weight control in the obese patient. They have been shown to offer the best combination of weight loss with fewer nutritional risks. In most cases, your insurance company should cover costs associated with the procedure and long-term care if you meet specific criteria. It is required that we determine bariatric surgery is medically necessary as well. The Bariatric Surgery Program at Froedtert & the Medical College of Wisconsin is part of the Comprehensive Weight Loss Center, offering patients the full spectrum of care. See our dietitian-approved recipes for bariatric surgery patients. Our program has helped hundreds of obese patients lose weight. Our holistic, multidisciplinary approach addresses all aspects of health — including psychological and medically related conditions — before, during and after surgery. In fact, we provide patients life-long, post-surgery support to be absolutely certain they achieve and maintain lifestyle changes. We are so committed to the long-term success of our patients that we maintain an extensive database of more than 1,000 patient records, so we can stay in touch and continue to provide support. Safe weight loss through surgery requires a strong commitment from the patient and the team of medical experts providing care. Education, one-on-one counseling, complete medical exams and testing, and continued support are top priorities, so our patients understand the requirements, responsibilities and benefits of undergoing bariatric surgery. Learn more about our quality efforts and read our quality reports in the Quality Care section. Our care begins months before surgery is scheduled to prepare patients and guide them through dramatic changes in their overall health. And this care continues through the months and years following surgery, to keep patients on course. Additionally, our program has been carefully designed and configured to provide the highest level of comfort and dignity. Among our team of experts are dedicated surgeons, nurses, dietitians and psychologists — all ready and willing to meet with patients one-on-one to share their knowledge and expertise and ensure their full recovery.